Studio Jules Art - Blog: Looking for Stocking Stuffers or Secret Pal Gifts? Looking for Stocking Stuffers or Secret Pal Gifts? We are always running around looking for Stocking Stuffers and Secret Pal gifts that are unique and one of a kind. Do you have a favorite Quilter, Fiber Artist, and family member in mind? 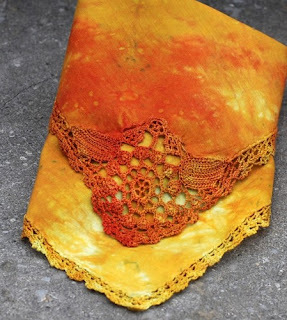 Take a look at the hand dyed handkerchiefs and fabrics at StudioJules on Artfire. I've left the Cyber Monday Sale Discount of 20% on the entire stock of Hand Dyed Silks, Cottons, Fat Quarters, Handkerchiefs, Bookmarks, Artquilts and Trims!